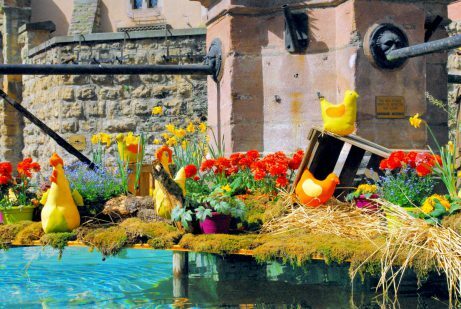 Eguisheim, birthplace of the Alsatian vineyards has been listed as one of the Most Beautiful Villages in France since 2003, and has been awarded the National Grand Prize winner for Flowers since 1989. The historic village plunges the visitor into the middle of the Renaissance. 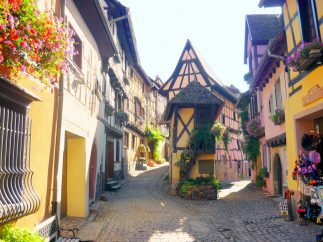 In 2013, a popular programme on France 2 consecrated Eguisheim as the “Favourite village of the French people“. 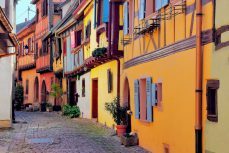 Located along the Alsace Wine Route, only 5km from Colmar, Eguisheim is surrounded by a 339 hectare vineyard, whose hills “Eichberg” and “Pfersigberg” are known as “Grands Crus” of Alsace. When looking at a photo of Éguisheim taken from above, it is easy to be amazed by the shape of this medieval city, which was built in three concentric circles around the octagonal castle. 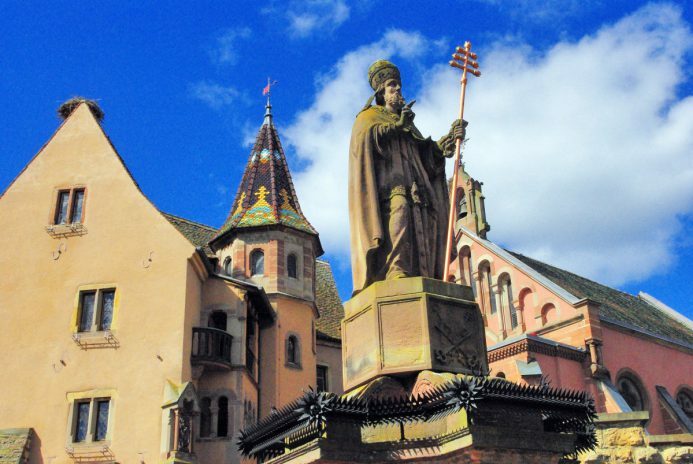 Legend has it that there was born Pope Leo IX (1049-1054), former bishop of Toul who was then known by the name of Bruno of Eguisheim-Dagsbourg. The village is not big. One or two hours should be enough to tour it. The main street (Grand-Rue) crosses the village from East to West. It passes by the main square: Place du Château Saint-Leon. The circular streets should be seen, particularly the rue du Rempart (North and South). The central square of the village is ornate with a large Renaissance fountain of octogonal shape: the St. Leon fountain (1557). The statue of Pope Leon IX was placed atop the fountain in 1842. The fountain is beautifully decorated for Easter, flowered in Summer and brilliantly highlighted at Christmas. At the very centre of the village lies the castle known as Château-Bas d’Eguisheim or St. Leon Castle. It has been essentially unchanged since the 16th century. This is where Bruno d’Eguisheim-Dagsbourg was born in 1002. Of the medieval fortress, all that survive today is the impressive octogonal wall characteristic of the 13th century, made up of rusticated stone. More than 2 metres thick in some parts, the wall was surrounded by moats, which were drained in 1835. 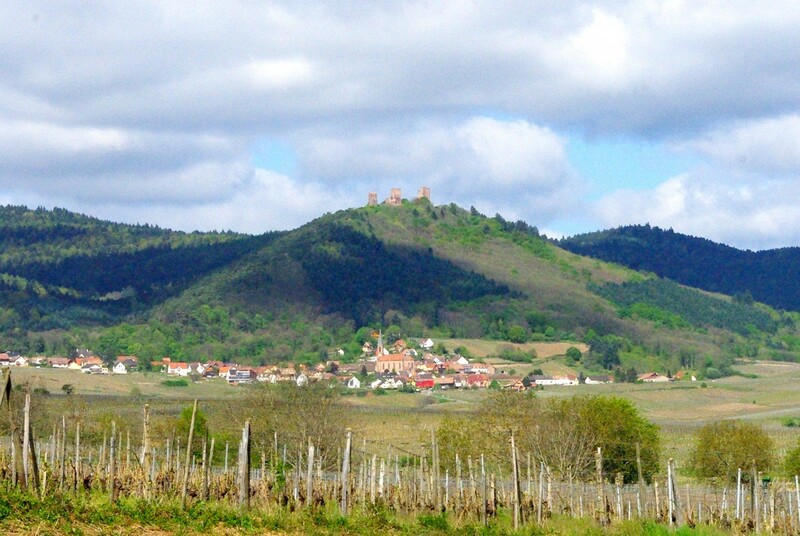 The first castle on the site was built in the 8th century by Eberhard, 3rd Duke of Alsace and nephew of St. Odile. The city is organised around the château, the roads ordered in concentric circles following the markings of successive fortifications. The château is only accessible through guided visits offered by the Tourist Office. The St. Leo Chapel is located at the Place du Château. This is where relics of Pope St. Leo IX are kept, as well as a Renaissance fountain surmounted by the statue of the Pope. Inside the chapel, the shrine contains a part of the Pope’s skull. 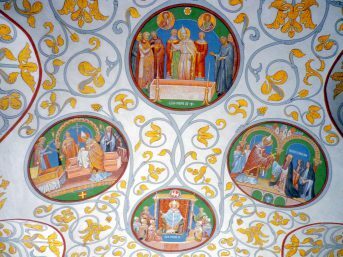 Medallions on the archway and the stained glass windows represent the stages of his life (birth, illness and healing by Saint Benedict, Leo as bishop washing the feet of the poor, Pope Leo the reformer and traveller, etc). Towards the centre of the village, the St. Peter and St. Paul church with its bell tower built in 1220 and its Romanesque tympanum (13th century) have been classified as a Historic Monument. The bell tower and the portal are the only remaining features of the building that date back to 13th century. 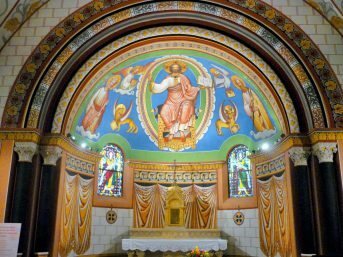 Inside the bell tower, the Romanesque portal is surmounted by a polychrome tympanum representing Christ being blessed, surrounded by St. Peter and St. Paul. The lintel depicts the parable of the Wise and Foolish Virgins (13th century) who, one at a time, knock on the door of Heaven. In the same place is kept one of the only “Vierges Ouvrantes” in Alsace, made from polychrome wood from the 13th and 14th centuries. 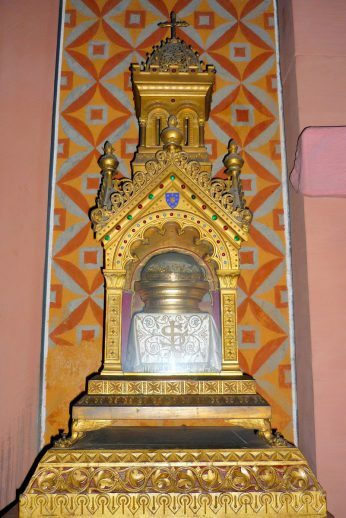 A “Vierge Ouvrante” (Opening Virgin) or shrine of Madonna, is a sculpture of Virgin Mary which can be opened like a shrine, and shows basically one of three iconographical motifs. The bell tower also houses a baptistery, an old Romanesque tub which would have been designed at the time of St. Leon. The nave was entirely rebuilt in 1807 to replace the dilapidated medieval church. However the choir stalls date from the 18th century. The modern stained-glass windows recall the stages of St. Leon’s eventful life. The beautiful organ by Callinet Frères was made in the 18th century and restored in 1962. 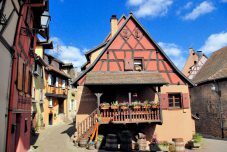 Eguisheim’s houses stand side by side to form a closely knit village. Generously decorated with flowers in Summer they open onto tranquil courtyards. On your discovery walk take the time to observe the fine wrought-iron signs and all these little details that reveal the village’s Alsatian heritage. 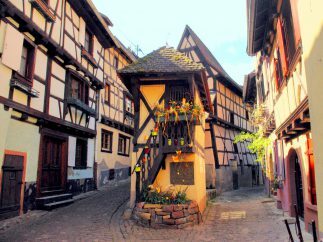 One of the most famous picture-postcard views of Alsace can be admired at the crossing of rue du Rempart-Sud and rue de l’Almend-Sud. The site is stunning in all seasons: in the Spring with Easter decorations, in the Summer months with flowers and during the Advent (leading to Christmas). Eguisheim’s charm is best displayed along the tour of the ramparts. 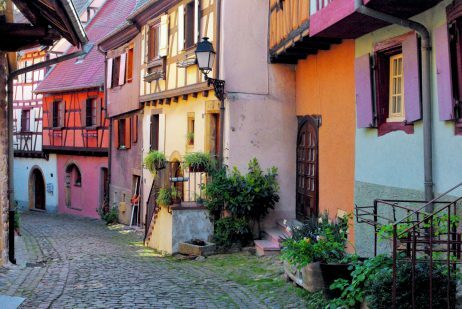 These straight and paved alleyways are lined with old half-timbered houses – some which are surprisingly narrow – very architecturally rich with their balconies, bay windows, pointed gables, and tithe courtyard. Start from rue du Rempart-Sud and continue to circle the village by rue du Rempart-Nord. The Grand Rue is lined with old houses with large dated portals, as well as two beautiful Renaissance fountains. Stone-made houses are a showcase of the wealth of their former owners. Out of the 16 tithe courtyards (cours dîmières) in the village, the most impressive is the one located at 3 Cours Unterlinden. Known as Unterlinden Court (or Catharinenhof), it has been mentioned since 1290. The yellowish façades date from the 16th to the 18th centuries. 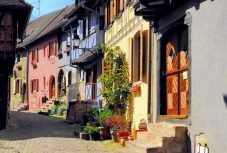 Since the Middle-Ages, the village has been dominated by the Three Castles of Eguisheim: Dabsbourg, Wahlenbourg and Weckmund. Now in ruins, they can be accessed by a small tourist road that winds through the forest: Route forestière des Cinq Châteaux. The road starts at Husseren-les-Châteaux. One kilometre later, park your car in the carpark and continue on foot (20 minute walk). One by one you’ll discover the three square keeps that overlook the vineyards and the Alsace Plain at an altitude of 590 m.
Back to the carpark, keep on driving to reach the Hohlandsbourg Castle and the Pflixbourg Castle before going down to Wintzenheim near colmar. 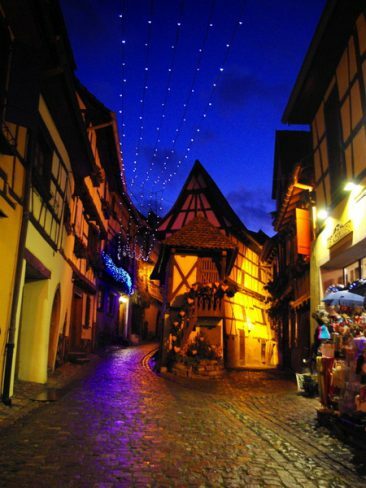 The picturesque Christmas market of Éguisheim is themed on the Alsatian customs and traditions. 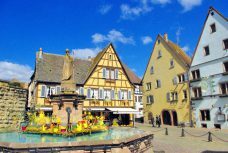 The Christmas market is hold in two squares in the centre of Éguisheim, and is easily accessible by a shuttle bus from Colmar (la Navette de Noël) during Advent. 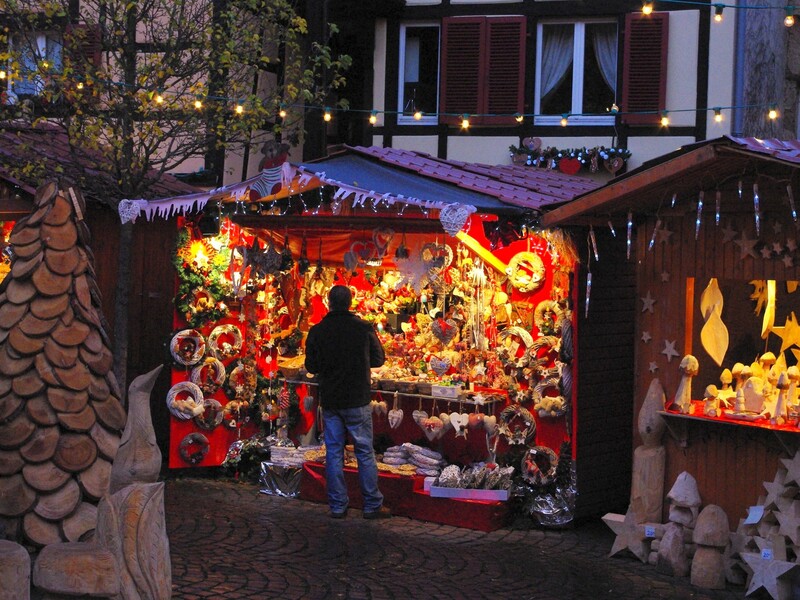 Find out more about Éguisheim Christmas Market. 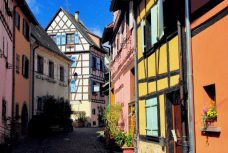 The website of the Tourist Office of Eguisheim, located at 22A Grand-Rue. Le petit train (the little train): a great idea to explore the village and its vineyards smoothly. Public restrooms are found behind the Tourist Office, Cours Unterlinden and at the Mairie carpark. 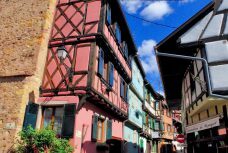 Read more about Éguisheim in French on the blog Mon Grand-Est. Parking de la Mairie (Grand’Rue) : 80 car spaces (daily charge of 3 euros). Coming from Colmar or the N83 road, you’ll find it to the left just before the Town-Hall building. Parking des Marronniers (rue des Trois Châteaux) : 60 car spaces (daily charge of 3 euros). Coming from Husseren-les-Châteaux, close to the village centre. Parking de la Tuilerie (rue de Malsbach) : 60 TOLL FREE car spaces. Next to the cemetery and the Tuilerie gymnasium. Parkings du Millénaire Sud et Nord (rue des Merles and rue des Oiseaux) : 70 TOLL FREE car spaces. The carpark at rue des Oiseaux is the nearest to the village centre (400 m). 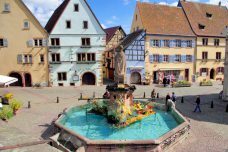 The best times of the year for visiting Eguisheim are Spring and Autumn, excluding weekends and Summer holidays… otherwise come here early in the day! Have a great visit!